A beth din, also spelled beit din or bet din (Hebrew: בית דין, "house of judgment;" plural battei din) is a rabbinical court. Tradition holds that the institution originated with Moses when he chose 70 elders to assist him with legal matters. In ancient Israel, the Great Sanhedrin of Jerusalem is thought to have functioned as a kind of supreme court with smaller battei din deciding cases at the local level. After the destruction of Jerusalem in 70 C.E., the beth din of Johanan ben Zakkai and his successors was the central legal authority for Jews. This court waned in importance, however, as the intellectual center of Judaism shifted to the great rabbinical schools of Babylonia. Since then, no single beth din has emerged as a central authority of Jewish law. Instead, local rabbinical courts have decided Jewish legal cases relating to both ceremonial and civil law, as well as criminal law that is not subject to secular courts. Today, the beth din is invested with legal authority in a number of religious and civil matters both in Israel and in Jewish communities in the diaspora, where its judgments hold varying degrees of authority, depending upon jurisdiction and subject matter. The first instance in the Hebrew Bible of an absolute ruler delegating his legal powers to lower courts came after Moses accepted the suggestion of his father-in-law, Jethro, to appoint 70 elders to assist in legal decisions (Exodus 18:20–25). "Select capable men from all the people—men who fear God, trustworthy men who hate dishonest gain—and appoint them as officials over thousands, hundreds, fifties and tens. Have them serve as judges for the people at all times, but have them bring every difficult case to you; the simple cases they can decide themselves." …Moses listened to his father-in-law and did everything he said. This situation was formalized in an explicit command to "establish judges and officers in your gates" (Deuteronomy 16:18). Deuteronomy 17 specifies a system of higher and lower courts, with the highest authority resting with the Temple priesthood and "the judge who is in office:"
If cases come before your courts that are too difficult for you to judge—whether bloodshed, lawsuits or assaults—take them to the place the Lord your God will choose (Jerusalem). Go to the priests, who are Levites, and to the judge who is in office at that time. Inquire of them and they will give you the verdict (Deuteronomy 17:8-9). The Great Sanhedrin at Jerusalem was called also "Sanhedrin Gedolah." It represented the supreme court of the country mentioned in (Deut. 17:8-13) and acted chiefly as the court of last instance. It also had a legislative function, and offensive wars—as opposed to defensive actions—could be initiated only with its permission. The president, who bore the title nasi, was the supervisor, but did not deliberate with its members on legal cases. Thus, the court technically consisted of 70 members, corresponding to the 70 "elders" appointed by Moses (Num. 11:25), plus the nasi, corresponding to Moses. Participation in these courts traditionally required the transmission of judicial authority in an unbroken line down from Moses, known as the semicha. Since the destruction of the Temple in Jerusalem in 70 C.E., the transmission of semicha was suspended. The Mishnah and Talmud, the seminal collections of Jewish legal tradition, distinguish between ritual or criminal matters and monetary matters and impose different regulations for them. However, the same beth din ruled in both kinds of cases. Any question that could not be resolved by a smaller court was passed up to a higher court. In ancient times, if the Sanhedrin was still uncertain, divine opinion was sought through a process of divination known as Urim ve-Tumim, utilizing the high priest's breastplate, which was inscribed with the Name of God and could give supernatural clues. Critical scholars doubt that the detailed descriptions of such a high court found in the Talmud are historical, being instead a description of an ancient ideal system postulated by the rabbis of the Talmudic era. In a like manner, they also spoke of a heavenly beth din which reflected the pattern of the earthly one (Soṭah 22b). A supreme beth din as the highest religious and civil authority of the Jews is known to have existed between 70 C.E. until the end of the third century. Rabban Johanan ben Zakkai's beth din at Jamnia became the intellectual and legal center of the Jews. This court determined the Jewish calendar system, and became the religious and national center not only for the Jews of Palestine, but also of the diaspora. Its power and influence increased under Johanan's successor, Rabban Gamaliel II, culminating under Judah haNasi. After the death of Judah ha-Nasi the beth din of Palestine lost its importance as a result of the rise of Jewish scholarship in Babylonia toward the middle of the third century, as well as the increasing oppression of the Palestinian Jews under the Roman rule. In Babylonia, no single beth din was considered a central authority, even for Babylonia alone. Instead, the higher the reputation of a presiding legal scholar, the greater was the authority of the beth din under him. Similar conditions continued in Babylonia during the time of the Geonim (589-1038), during which competing rabbinical schools prevented the emergence of a single authority. Several attempts to establish a central high court all proved futile, and as Judaism moved into Europe the challenges of centralizing Jewish law became even more challenging. Rabbi Jacob Berab (sixteenth century) nearly succeeded in reintroducing a formal system of ordination for halakhic judges. If he had done so, his beth din in Toledo, Spain, might have achieved the central position of that of Johanan ben Zakkai, but he encountered too much opposition. Contemporary beth din kosher food division in New York City. In the Talmud, the term beth din (plural bettei din) was applied to every Jewish court, consisting either of 23 members, who sat only in capital cases, or of three (according to some, five) members, who decided in monetary affairs (Sanh. i. 1-4; Tosef., ib. i. 1). However, in practical terms, even in Talmudic times, it was normal to have 11 or more scholars actually present at court (Sanh. 7b), rather than 23. Moreover, a scholar of high standing required no assistant for holding court (Sanh. 5a). During the Middle Ages, as well as in modern times, the local rabbi alone frequently constituted the beth din. In larger communities today, a beth din often consists of at least three members, which sits daily except on Sabbath and holidays, and decides ritual as well as legal questions that are not under the jurisdiction of a secular court. The local rabbi generally presides, but in large communities the direction of the beth din is an office in itself, the incumbent of which bears the title rosh beth din. Conversions to Judaism to determine whether a prospective convert is sufficiently prepared to enter the "Covenant of Abraham"
Questions relating to burial practices and mourning. 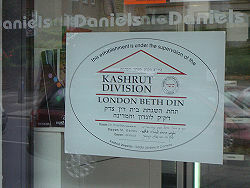 Battei din are also used within the Orthodox Jewish community for civil disputes. The halakhic compendium Shulkhan Arukh, (Choshen Mishpat 26) calls for having civil cases judged by religious courts instead of secular judges. As modern Western societies have increasingly permitted civil disputes to be resolved by private arbitration, religious Jews have taken advantage of this legal environment by signing arbitration agreements appointing a particular beth din as their arbitrators in the event of a dispute. By this device, the rules, procedures, and judgment of the beth din are accepted and can be enforced by secular courts in the same manner as those of a secular arbitration association. However, religious courts cannot decide such disputes without the prior agreement of both parties. Av Beth Din (אב בית דין, literally "Father of the Court," abbreviated אב"ד / ABD) is the most senior jurist who may join in the adjudication of cases or advise the presiding dayanim. The av beth din will usually be a highly respected rabbi and posek (decider), who can give formal responsa. Rosh Beth Din (ראש בית דין, literally "Head of the Court," abbreviated רב"ד) is equivalent to a chief judge. He will be the senior member of a three-judge panel. In smaller courts the av beth din also serves as the rosh. 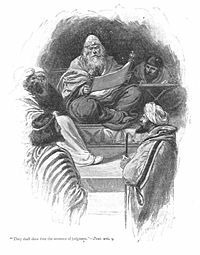 Dayan (דיין, Rabbinic Judge) sits and adjudicates cases. He is entitled to question and cross-examine witnesses, deliberate with the other judges, and vote in the court's decision. Chaver Beth Din (חבר בית דין Friend of the Court, Amicus curiae) is an internal adviser to the court. He may bring specialized expertise to the beth din. Often a chaver will have training in secular law or science who can share his experience and perspectives with the court. For example, some battei din that deal with issues regarding ritual slaughter may have a chaver who is knowledgeable about veterinary medicine or biology to assist the court as an expert witness. Beth Din of America. Beth Din of America: Rules and Procedures. New York: Beth Din of America, 1997. OCLC 236088590. Edelman, Martin. Courts, Politics, and Culture in Israel, Constitutionalism and democracy. Charlottesville: University Press of Virginia, 1994. ISBN 9780813915074. Golinkin, David. The Appointment of Judges, Their Attributes and Court Procedures in Jewish Law. Jerusalem: Center for Women in Jewish Law, Schechter Institute of Jewish Studies, 2003. ISBN 9789657105153. Neusner, Jacob. School, Court, Public Administration: Judaism and Its Institutions in Talmudic Babylonia. Atlanta, Ga: Scholars Press, 1987. ISBN 9781555401153. Singer, Isaac Bashevis, and Curt Leviant. More Stories from My Father's Court. New York: Farrar, Straus and Giroux, 2000. ISBN 9780374213435. This page was last modified on 4 June 2016, at 16:48.